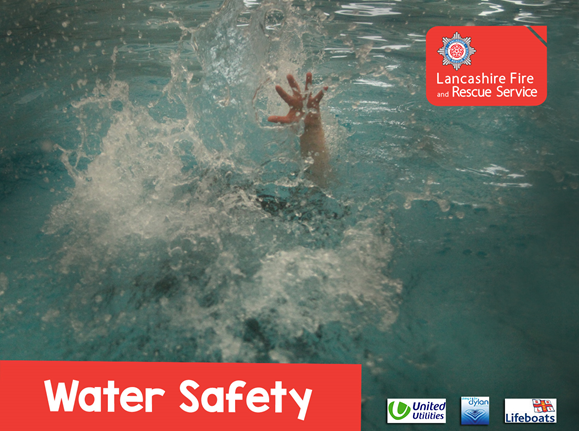 Lancashire Fire and Rescue Service (LFRS) are extending the roll out of a water safety campaign at a critical time when the weather is starting to warm up and a week before Easter holidays which means time off for schools and families. Due to the number of open water fatalities that have occurred in the Lancashire Fire and Rescue Service response area and the immediate surrounds in the last few years a water safety board initiative has been identified which it is felt could help reduce this risk with the ultimate goal of making Lancashire safer. In August 2018 two water safety boards were first launched at Cuerden Valley Park which were funded by the families of two youths who had lost their lives at sites nearby. The water board initiative was put forward by South Yorkshire Fire and Rescue Service and LFRS were early adopters of the initiative with the hope that they hope would eventually be rolled out nationally both by Fire and Rescue Services but also from other landowners and private companies. One such landowner, United Utilities, saw the work done by LFRS last year and made it one of their priorities for 2019. Following months of planning and research Thursday 4 April saw United Utilities along with Lancashire Fire and Rescue Service and Greater Manchester Fire and Rescue Service mark the start of a scheme to help prevent reservoir drownings. Greenbooth Reservoir near Rochdale, is the site where Paul Lawson tragically lost his life in June 2017. Paul’s family unveiled a new throwline which has been installed in his memory. 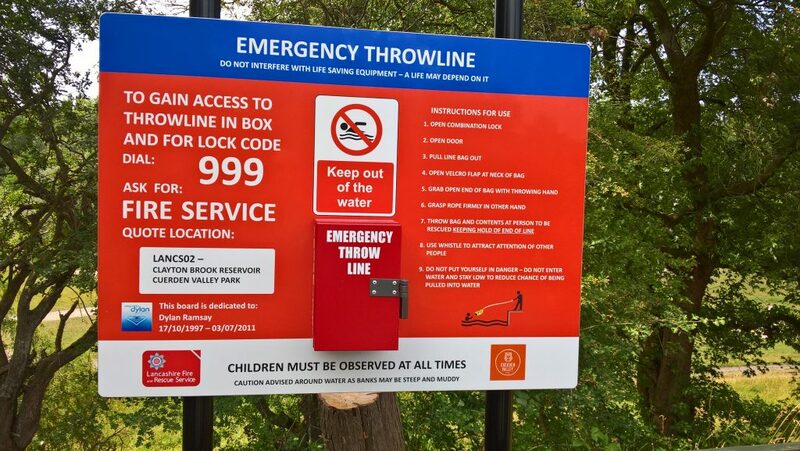 Throwlines are being installed at 20 locations around eight reservoirs across Greater Manchester and Lancashire, each dedicated to the memory of someone who lost their life. The boards will hold key life-saving advice on them as well as accurate location details in the event that the emergency services need to be contacted. The boards will contain a ‘locked’ canister, which is accessed by a code given to the caller by fire control room operators, containing a whistle and throw line which gives people a means of assisting someone in trouble without risking entering the water themselves. The boards are bespoke to their location and contain a unique location code so that emergency services can locate the incident as quickly as possible. Group Manager Mark Hutton, from Lancashire Fire and Rescue Service said: “We are really pleased to see a major utility provider deciding to install water safety boards and by doing so recognising just how important they can be in preventing loss of life, both in terms of the important safety messages they convey, and also their life saving function in the event of an emergency. “We are increasingly working with colleagues from other Fire and Rescue Services, North West Fire Control and other open water site owners who are now starting to take a similarly pro-active approach at their high risk sites. Although water safety boards are an important safety measure, they are only a small part of keeping people safe around water. “Raising awareness of the hazards that water can present is even more important and this month sees the launch of the National Fire Chiefs Council’s annual campaign – Be Water Aware. We hope that this campaign, and boards like these, have a real impact on people’s awareness of water risk as sadly every year we see loss of life which could be prevented through increased understanding and awareness. LFRS visit Lancashire schools in the lead up to school holidays where they share advice on campaigns such as ‘Dying for a Dip’ and ‘What Lies Beneath’ which highlight the dangers of open water swimming. Research has shown that it is not just children who are high risk as dog walkers and runners are also amongst those who get into difficulty in water and these campaigns aim to highlight this. Cold water shock is another key theme that the fire service wishes to push to the public as even those that are strong swimmers are affected by the cold water and cannot control their body’s reaction, often resulting in a heart attack, even in the young and fit. Installing water safety boards at these locations does not condone swimming but recognises that water safety messages do not always reach absolutely everyone who might not be aware of the dangers. The boards then act as a further tool to prevent fatality numbers. If the throwline pilot scheme is a success United Utilities will consider rolling it out to other reservoir sites around the North West. The National Fire Chiefs Council’s annual campaign – Be Water Aware will start from 29 April 2019.